I’m not sure you can tell in the picture, but that is a bathtub FULL OF CUCUMBERS. A couple of years ago, I learned the hard way that pickling season in Florida does not equal the same pickling season for the rest of the country. 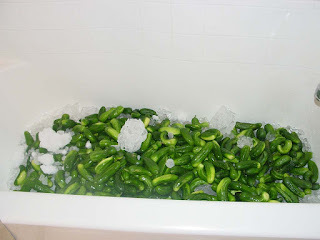 At the time, I experimented with a fermented pickle recipe, which required several days of open air fermenting, adding new brine, and skimming scum. All my pickle peeps were claiming these pickles were the bee’s knees, so I promptly went out and picked up 3 bushels of fresh cukes. I was anxious to have quarts and quarts of delicious, home-fermented dill pickles, so I gave it a shot. Now, by the time early-season cukes are ready in Florida (May), the weather is already on the verge of hot-as-balls. As of this past weekend, the temps were already in the mid-to-upper 90’s, so you can imagine what temperatures like this can do to fermenting cucumbers. After the third day of my “pickle experiment,” my husband and I walked into the house to a smell that resembled fresh road kill and rotting vegetables. The fruit flies were having a party, and we weren’t invited. It took many trips to the compost pile and many hours of cleaning, scrubbing, and disinfecting to clean up the mess. Now, several years later, I know that fermenting vegetables require very COOL temps, and we have a very short, if any, window of opportunity in the Sunshine State. I did; however, successfully make some awesome sauerkraut this past winter! Pickle season is upon us again, and I am looking forward to another stab at making the perfect pickle. I’m almost there! well? what happened? did you pickle or not? lol there is a joke in there somewhere! 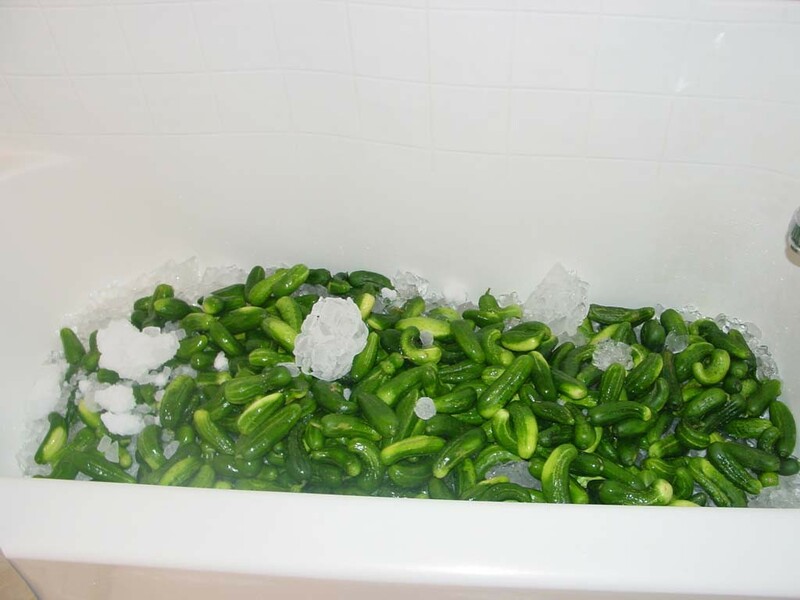 I have just one question...why there's a tub fill it with cucumber and ice? OK I afraid that the answer have something related with a party, liquor and many many guest.